Thank you for submitting your reservation for John Pennekamp State Park. All gear and drinks included. Divers from around the world visit John Pennekamp Coral Reef State Park to explore the living coral reefs of the Florida Keys and experience diving amidst the area's natural wildlife habitat. 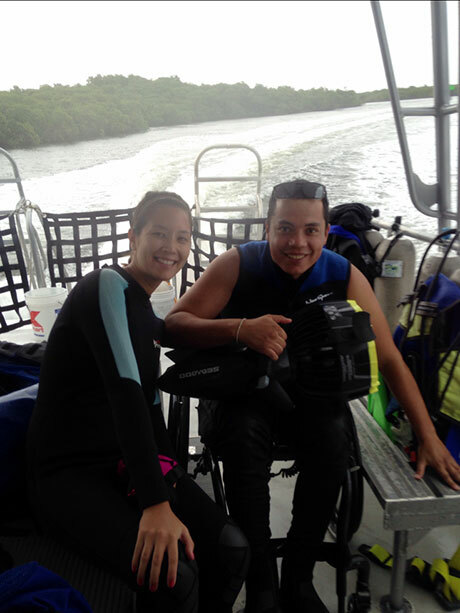 Our PADI 5-Star Gold Palm facility offers two-location, two-tank dives twice daily, at 9:00am and 1:30pm. Equipment rental is available. Contact our dive shop about reservations and special rates for groups and pre-paid tours. All of tour boats have at least one vessel equipped to accommodate the boarding of wheelchairs for our guests with special needs. Carysfort Reef Light is located approximately six nautical miles east of Key Largo, Florida. The lighthouse has an iron screw-pile foundation with a platform, and a skeletal, octagonal, pyramidal tower, which is painted red. The light is 100 feet (30 m) above the water. It is the oldest functioning lighthouse of its type in the United States, completed in 1852. Carysfort Reef is named for HMS Carysfort (1766), a 20-gun Royal Navy post ship that ran aground on the reef in 1770. The light is currently a xenon flashtube beacon. We are very excited to offer a Dive Tour to the Carysfort Reef site, since only a few tour boats visit this location. ...with some trips to the Spiegel and Duane occasionally, scheduled in advance and conditions permitting. Average depth of 65 - 130 feet, Adv Open Water Diver or higher. Call the Dive Shop at 305-451-6322 for more information. Minimum passenger requirements apply on all tours. Please call (305) 451-6316 for Private Charter rates along with Group information. Charter Rate per Tour with a maximum of 20 dives $1200.00 plus tax. 4 day class. Includes: Everything you need to become a PADI-certified diver. Complete your openwater training in the warm tropical waters of the Florida Keys. Includes 4 reef dives. 3 day class. Includes: navigation and deep dive. Personal or Group in-water guide available upon 24-hour request for $40 plus tax. Each additional Diver (guided) is $20 plus tax. Max group size is 6 Divers per guide. All prices and schedules are subject to change without notice. Minimum passenger requirements on all tours. Reservations are recommended for all tours and must be confirmed in person no later that one hour prior to tour time. Boats leave the dock promptly at published time. Schedules subject to seasonal change. Travel Web Design by Wodu. © Coral Reef Park Company, Inc.
© Coral Reef Park Company, Inc. All rights reserved. Mobile Web Design by Wodu.